Whether you consider yourself a full-time athlete or just the occasional weekend warrior, the last thing you want keeping you off the playing field is an injury. Injuries can happen to the best of us and, unfortunately, the longer you participate in a sport, the greater the chance you have of getting hurt while doing it—especially as you age. Of course that’s not to say only older players compete under the threat of a sports-related injury. Competitors of all ages run the risk of limping off the field every time they step onto it. That’s where Horizon Rehabilitation & Sports Medicine’s talented and experienced staff comes into play. We’re just like you, because we’re also athletes (and some weekend warriors, too). We understand as well as anyone how watching from the sideline with an injury can be almost as painful as the injury itself. That’s why we’ve dedicated ourselves to utilizing the latest and most advanced evaluation, treatment, and healing techniques available to keep you in the game. Only at Horizon will you find the AlterG® Anti-Gravity treadmill, designed from the ground up to minimize running and walking’s impact on your body while you rehab your injuries. We have certified ASTYM® soft tissue therapists and the areas only certified IMPACT physical therapist to accurately assess and care for concussion related injuries, using the latest methods and research available. Combine with our heated resistance swimming pool to build strength and endurance, and you’ll quickly discover why Horizon Rehab is widely regarded as a world-class physical therapy facility, right here in the Lowcountry. 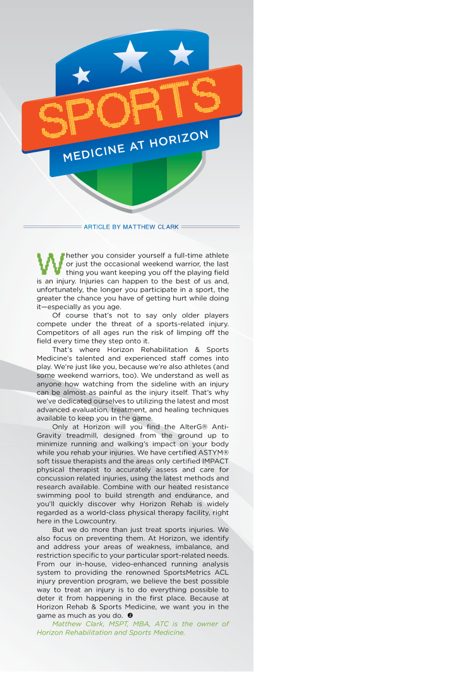 Matthew Clark, MSPT, MBA, ATC is the owner of Horizon Rehabilitation and Sports Medicine.